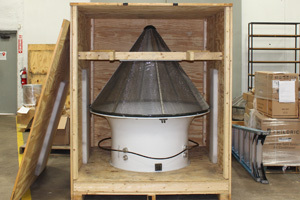 A tec, Inc. has the capability to design and manufacture bellmouths and screens. 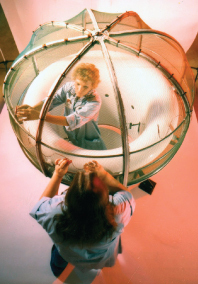 Atec has manufactured bellmouths and screens for over 40 years. 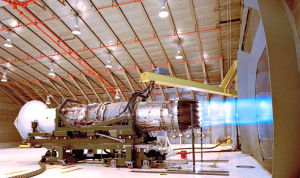 Atec supports engine test applications for a variety of engine types and sizes. 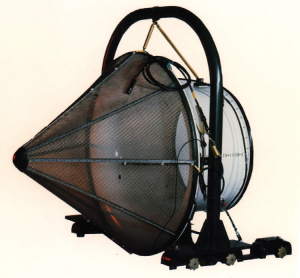 A properly sized and manufactured bellmouth is critical to reaching an engine’s required performance parameters. Atec’s engineers employ the latest 3-D design and CFD analysis tools to develop an inlet bellmouth that meets the OEMs air flow requirements. 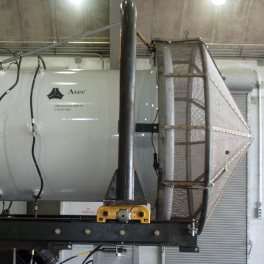 Atec designed, built and installed all of the engine test equipment shown in these photos as well as control instrumentation and the fuel system. The new 50K lbs. Thrust Stand is innovative in that it eliminates the old deadman restraints in favor of clevises attached to the floor. This Thrust Stand is also in use by FMS users for other high-thrust engines. We also provide build-to-print services for clients across a broad range of inlet styles and materials. Our traditional mesh screens are precision welded and fitted to eliminate stress tears or openings. Vital Link, Celtech, Hager Machine & Tool and Atec are cooperating on new, composite materials. Additionally, advanced low turbulence screens employing 3D printing, waterjetting, and lasercutting techniques in manufacture are now available to meet the most demanding intake requirements. Probes, dress gear, and accessories are also available. Call us for evaluations, spare parts, and repairs.